The battle between men and magic ramps up in this issue of Monstress. Maika is searching for those responsible for her mother’s death. Along the way she has met both those who have arcane gifts and those who are human, who will go along with her on her quest. However, before that can continue, Maika must first battle her own inner demon that came out to violently play in the cliffhanger from the previous issue. Even for readers staying up to date on this series, the opening page of Maika is mesmerizing. For those who decide to pick up at issue 3, they will be astounded by the artowkr that Sana Takeda presents. Between the summation page at the beginning that first page the reader can instantly become engrossed with the story. While not all the panels are as cleanly rendered as the opening page, the detail level of the series continues to be phenomenal. Emotionally charged and action filled sequences are set askew in the panel layouts. The more easy block pages allow the reader to mentally rest without realizing it. Instead of packing the pages with overworked dialogue, Liu let’s Takeda take center stage in the world building that has occurred throughout the series. The art is not consistent throughout the whole story. While strong, the occasional panel takes you out of the reading experience. Perhaps these panels lack the details of other pages. An example is Maika’s conversation with the cat halfway through the story. The center panel is attempting to provide a perspective that will show you both characters. The panels on either side are rendered with so much purpose and emotion. However, the high angle of the center panel cannot allow that and so if feels almost like a sketch. It’s an unfortunate reason to be pulled out of such a gripping story. As always, those who do not have an affinity for manga inspired art will also not enjoy all of the facial styles. Takeda’s roots in the manga style are a key to both the story and art. Hopefully it will help those who are not fans gain more of an appreciation of what it can accomplish. Taking place at night the issue is very dark in tone, both for subject matter and visually. The issue begins with a fight. It is quick and direct. In some ways you almost forget it happened as soon as it’s over. The rest of the issue has a nice ramp up toward the brutal violence that lays toward the end. The connections that can be made between the human’s hunt for those with arcane abilities and modern racism, xenophobia and totalitarian governments is as clear as ever. However, pure hatred or two dimensional representation continue to be thrown aside. More time is given toward the backstory of why Maika is of interest and her potential connections to the characters at play. Plus, Liu and Takeda continue to cast doubt on Maika’s role, and if she is truly an innocent protagonist or her own worst enemy, hidden deep inside. 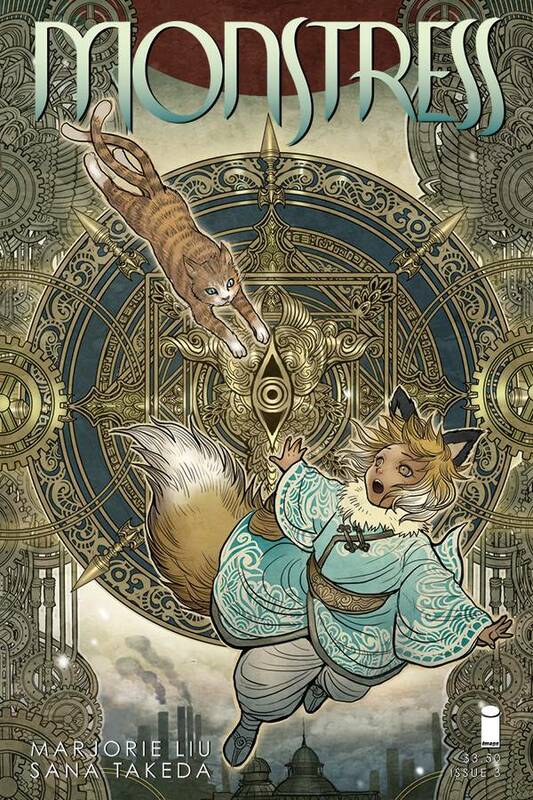 As always we’re looking to see just how Monstress Maika will become. Themes of family crop into interactions and panels. From Maika’s search for her mother and vision, to the mother whose child is used as an instrument during an interrogation, and Yvette’s own family being brought up against her; family is a key element. It’s subtly weaved throughout the tale. It adds to the factors, such as the art and dark color work, that helps create such a strong emotional response, while reading. Compounding to this are the brutal and violent scenes. Often, comic scenes of gore can feel empty and violence for it’s own sake. However, the action sequences feel driven and purposeful. They never make you say, “Well, we’ve had a lot of talking so now we need some action.” Instead, the hunt for Maika has built in purpose for the action that takes place anytime the army of man is near. Maika and the others are striving, not only to unlock a mystery, but survive. The thing hunting them down is hatred for hatred’s aim. In our current political climate, there are plenty who can feel a connection to the need to rise above and survive such a mentality. What Monstress elicits is a primal emotional reaction that most comics strive for and fail to accomplish. This tale is dominated by women who are brave and resourceful. However, they are not afraid to show fear, doubt or love. They are allowed to be humans an not stoic strong female archetypes.